The Find IP Address tool will let you to find the IP Address of anyone: someone who you are talking with, someone who you are exchanging emails with, a friend, colleague, professor, etc. First, you must use the following input box to create a link to a story that you will share with the "target". The link will automatically be shortened using the bitly service. 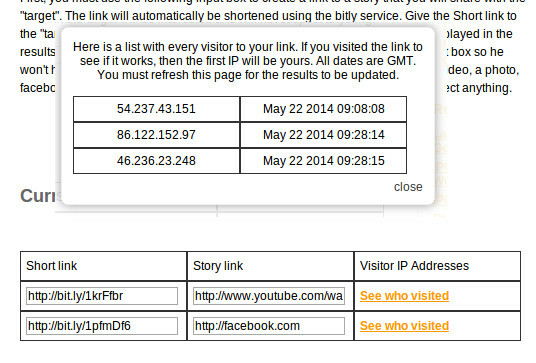 Give the Short link to the "target" and once he clicks on that link his IP Address will be saved and displayed in the results table. After he clicks he will be directed to the link you added in the input box so he won't have any idea that this ever happened. You can add a link to a youtube video, a photo, facebook link, whatever you think the target will be interested and will not suspect anything. You have to create a subscription before you can use this tool. If you already have an acocunt you have to log-in.